The world changes all the time! But if you look out for them, you’ll see scenes that haven’t really changed for a great many years. What do I mean by this? Simple things, for example cars look very different than they did 40 years ago, but many of the roads and streets that they drive along haven’t changed so much. With the right scene and making sure that nothing too modern is in the frame, you can take a photograph that truly could of been taken 20, 30, 40 or even 200 years ago. 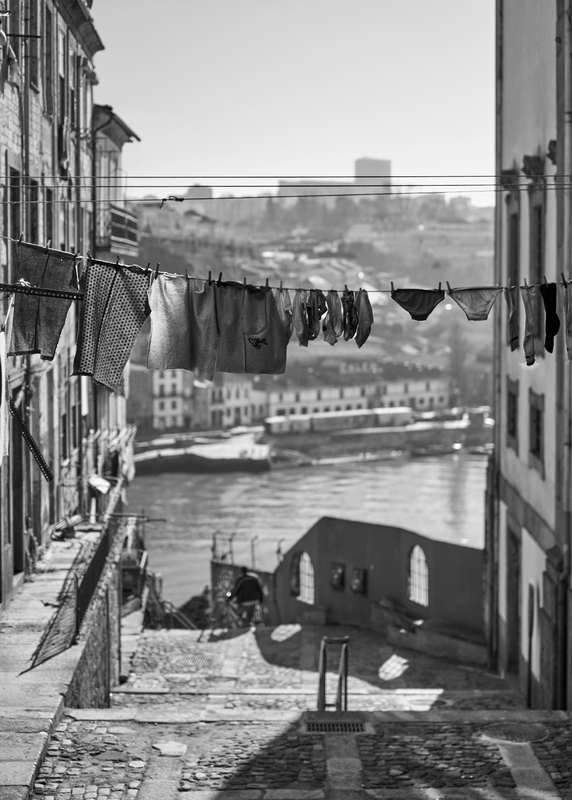 This ancient, unevenly paved walkway, winds itself down the steep slopes of the Douro valley, terminating at the river’s edge. It’s far too narrow for cars, and therefore is uncluttered by modern roadside furniture. For centuries the families living in the homes lining this walkway have gone about their lives; their employment, and domestic chores. The world that built this pathway has changed forever, the people that colonised the new world are long gone. But the scene today is not so different, as people go about their lives in a very close approximation to the way that they have always done. It’s true. I have a similar picture taken 20 years ago at the same location (a bit higher actually because the bride upper deck is visible) and when I took it it also looked at least 20 years old… 🙂 Maybe I’ll scan the negative someday show it to you. Viva, here it is. It’s a small sized scan I had in my hard drive. I could go find the neg and scan it again but it would be a awful lot of work since I have the scanner boxed away… But I think you get a good sence of it. Do you live in Porto or something? Thank you Fabricio, I really like it! I think the bridge is a great addition to the shot. Thanks for taking the time to send it to me. Would you like me to edit your comment to removed the link (so anyone visiting my blog doesn’t have your DB url)? Or something really!! I spend about 6 months a year in Porto, but I think it’s time to be here 100% and commit to learning Portuguese! And yes, you may remove the link. The image may be ditched sometime. I didn’t check if there was a contact form or email before posting otherwise would have mailed it to you as I did with the other images I just mailed you.